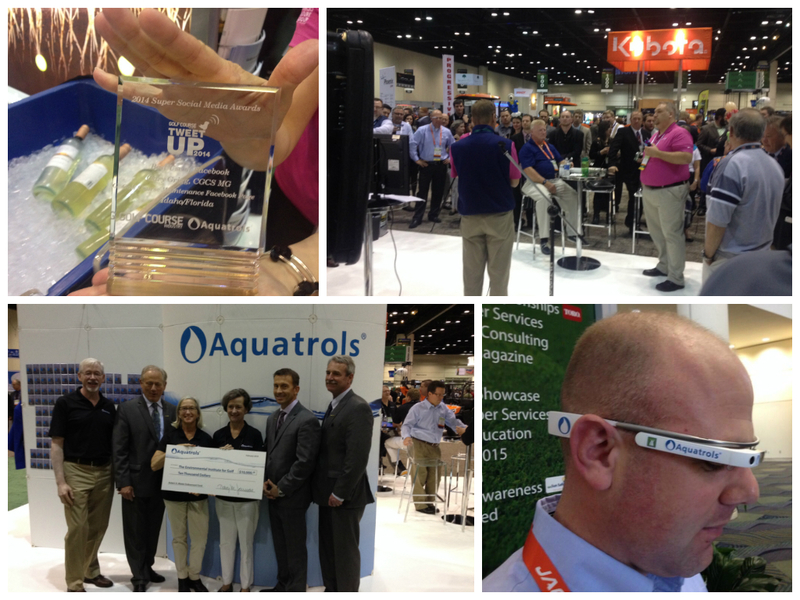 Last week, representatives from Aquatrols attended the 2014 Golf Industry Show in Orlando, Florida. The annual gathering attracted thousands of golf course superintendents, researchers, students, and industry professionals from around the world f0r a week of education and networking. The crowd for the 2014 TweetUp was the largest yet, demonstrating the growing number of turfgrass professionals who have made social networking an integral part of their management practices. Following the awards ceremony, attendees were treated to the smooth sounds of Rick Bales on acoustic guitar while Stupendous Stu wowed kids and adults with his unbelievable balloon art creations. Meanwhile, Aquatrols employees distributed 250 long-stem roses to visitors, tying into the newly launched “We Fix Relationships” campaign. From the new, on-site badge printing process to the dedicated “Tech Corner,” it was clear from the start that technology would play a major role at this year’s Golf Industry Show. In that vain, Aquatrols was proud to partner with Bill Brown of Turf Republic to bring you GIS “Through the Glass.” Equipped with a pair of Aquatrols branded Google Glass, Bill provided unprecedented live coverage of the show on his Turf Republic website for those who could not make the trip to Orlando. GCSAA TV also did a tremendous job of offering live content from the show floor in 2014. Many of their videos are available for free viewing here. Another major theme at the 2014 show was a continued focus on sustainability. Dr. Frank Rossi was one of a number of researchers to present on the topic of sustainable turf management throughout the week. Rossi urged attendees to think of their properties more as “urban grasslands” than “just golf courses.” He stressed the importance of measuring everything you can and setting realistic goals for reducing inputs. Aquatrols followed through on the sustainability theme by presenting a $10,000 check to the Environmental Institute for Golf and the Robert A. Moore Endowment Fund. Named after late Aquatrols’ founder Robert Moore, the endowment funds research specifically aimed at optimizing the growing environment for golf course turf, with specific goals for increasing the effectiveness of applied water, fertilizers, and pesticides, thereby reducing inputs. We want to take a minute to thank each and every person who stopped by the Aquatrols booth during the 2014 Golf Industry Show. We hope to see you all next year in San Antonio! Until then, you can check out more pictures from GIS 2014 on our Facebook page.